Window glass stays cleaner much longer. More window cleaning within reach. This method of cleaning windows requires 100% purified water which goes through a filtration process called a reverse osmosis. The purified water is then pumped through a carbon fibreglass telescopic pole. The 100% purified water is excellent for cleaning windows because there are no detergents used which, in turn, means no sticky residues are left; windows do not soil as quickly and therefore stay cleaner for longer. What could be more environmentally friendly than pure clean water? That’s all that we use to clean your windows – no secret ingredients, no detergents – just pure clean water. It doesn’t matter if some of the water spills on awnings of flowerbeds, or other sensitive areas, because it is just water – and since it’s de-ionized water, it will evaporate without leaving any marks or stains. All water is carried on board our van and we clean with hot water. Using Reach and Wash also avoids disturbance of borders and landscaping. Guttering is no longer at risk of damage by ladders. This also enables conservatory roofs and atriums to be safely cleaned. 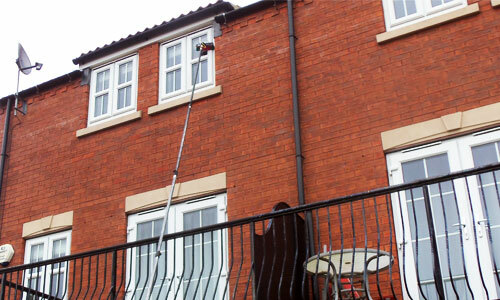 Our window cleaners can easily Reach and Wash windows above sensitive ground such as lawns and flower beds without causing damage we can reach inaccessible areas, up to 45ft, using a water-fed pole. Window frames and sills are safe too – not just from prying eyes – but from potential damage when ladders are rested against them to allow access to window cleaning on the upper floors. 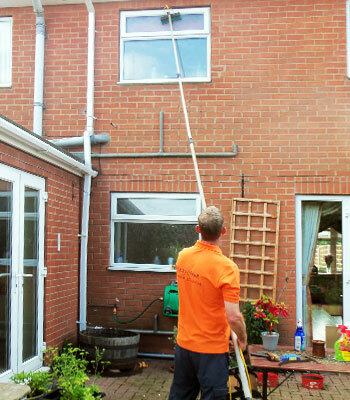 We are fully trained in cleaning windows safely. Our experience and expertise of using the Reach and Wash method provides us with the skills to be able to do an excellent job every time. Our work will always be carried out to the highest of standards. Solar panel manufacturers do not recommend using any kind of household cleaning chemical for solar panel cleaning. Using detergents leaves a sticky microscopic film on the solar panel which actually attracts dirt and grime and causes your solar panels to become dirtier, and therefore less efficient. We use purified water only. Conservatory roofs are easily and safely accessible with this system. Fascias and soffits can be cleaned as well as your garage door.